I was on a school trip and it was the last day. I was with the slower group. The other two groups had all seen a turtle and scores of fish, but not this group. They were still doing skills. 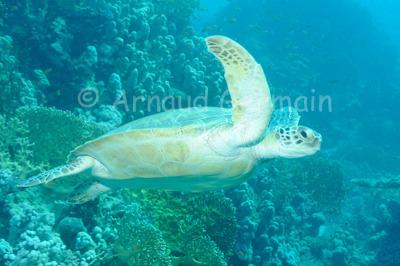 During the end of the dive, luckily, we spotted this green turtle on the North side of Marsa Shagra bay. The students had a good look and suddenly, the turtle swam to take a breath. I captured the moment when it started to swim. Nikon D700, Nikon 28-105 mm macro at 40mm, F9, 1/125th, ISO 400, Ikelite Housing and Ikelite DS160 strobe set on TTL. Marsa Shagra Bay, about 15 metres down, Marsa Alam, Egypt.